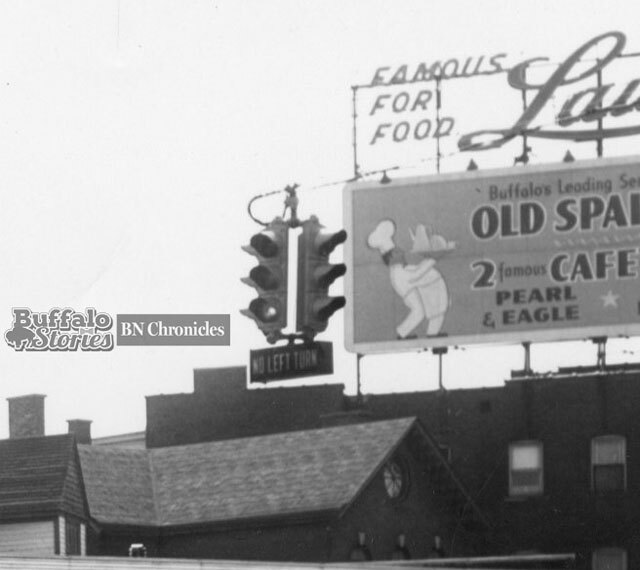 For many of us, imagining what Buffalo looked like before the urban renewal efforts of the 1950s, ’60s, and ’70s can be tough. Perhaps one of the most difficult ideas to grasp is that the area we now call “Canalside” and the area we think of as “downtown” were really a single continuous area without any sort of distinct border. The massive Skyway/I-190 complex of elevated roadways and interchanges make far more of a statement than the previous few elevated railbeds in the same footprint did. The several block imprint of the Marine Midland Tower also acts as a psychological “You Are Now Leaving Downtown” sign for anyone trying to walk from the business district to the inner harbor. 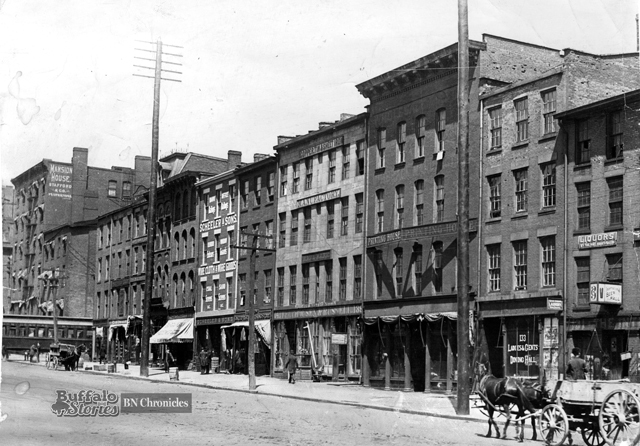 This 1890s photo was taken in the 100 block of Main Street. 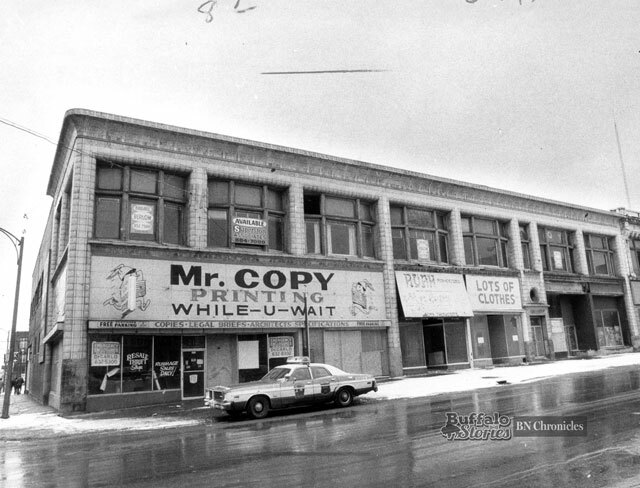 These buildings once stood in the massive area now filled with One Seneca Tower, which was known as Marine Midland Tower when it opened as Buffalo’s tallest building in 1970, and later known as HSBC Tower, when Marine Midland Bank was sold. Some of the businesses visible in this photo include one still in operation. 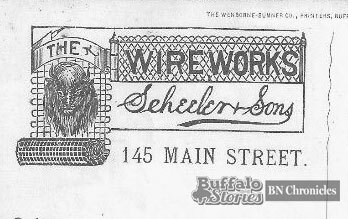 Scheeler & Sons, at 145 Main St., became Buffalo Wire Works in 1903. The plant is now on Clinton Street in Buffalo. Two doors down at 139 Main is Russell & Watson. 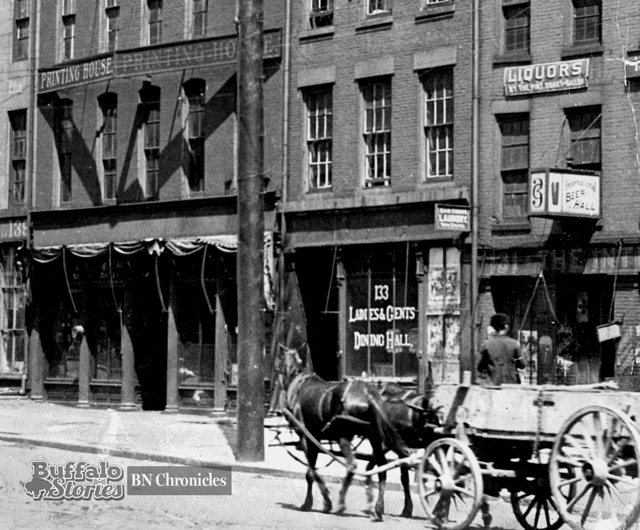 Founder William Russell came to Buffalo in 1830 at the age of 3 on a canal boat with his parents, settling on the outskirts of the city at what is now Huron and Franklin, a block south of Chippewa Street. One of his favorite memories of youth was hunting squirrels with his father around what is now Delaware and Huron. 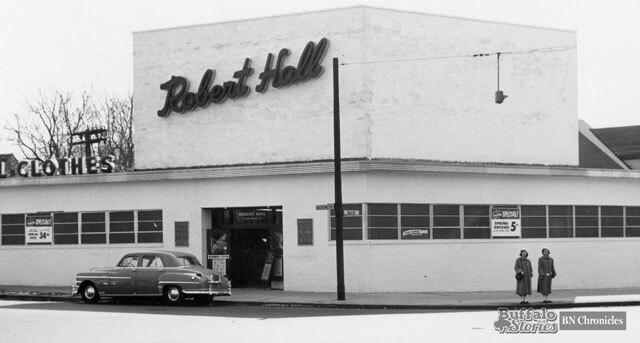 He started selling ship and hotel supplies at this location in 1859. He died at 92 in 1919. The saloon at 131 Main St. was a pretty rough and tumble place in the 1890s. Following a brawl inside the gin mill in 1896, 16 men were arrested. First Precinct police needed two wagon trips to haul in all the offenders. The men spent the night in lockup before being fined $5 apiece at sunrise court. 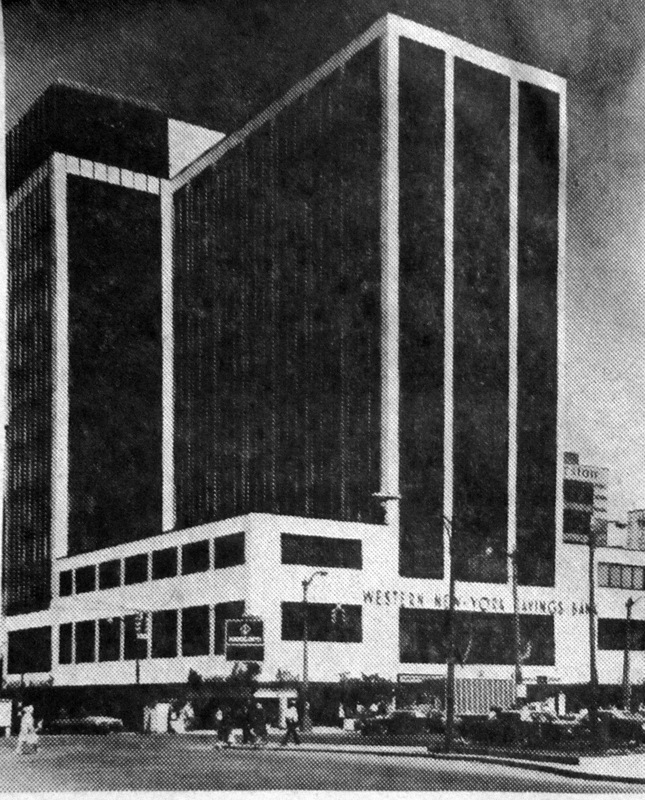 Known for generations as Western Savings Bank, in 1980, Western New York Savings Bank took an ad touting its history and showing off its still relatively new headquarters building on the corner of Main and Court. Today, this building has a CVS Pharmacy at street level. Of course, following the rail and the streetcar to Parkside soon enough was the automobile. King’s Official Route Book was the Mapquest.com of the early automobile era. It gave new drivers not only street names as far as getting from one place to another, but offered landmarks as well in an era when street signs may not have been the most reliable or varied. In the 1913 edition, the book makes notes of several landmarks you’d see driving on Main Street from downtown through Parkside on your way from Buffalo to Batavia. 38.6 miles, Road mostly all brick and state road. 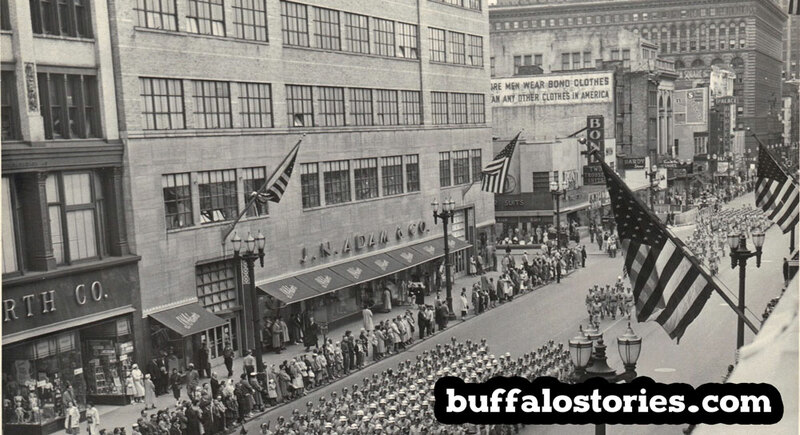 0 Leave Soldiers’ Monument and Park on right, go north on Main St., following trolley . 3.9 Cross cement bridge over R. R.
Between the businesses in the Parkside neighborhood itself, and the business along Main Street, it was possible, for much of the neighborhood’s history, for someone living in the area to not have need to leave the neighborhood for months at a time. 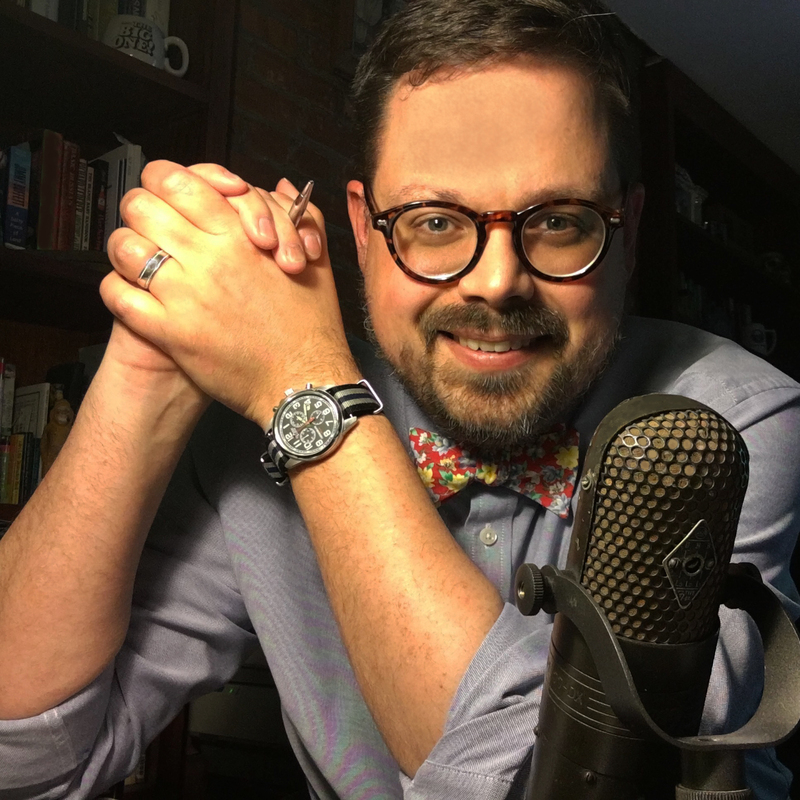 Without Main Street, there would not have been a Flint Hill or a Parkside. 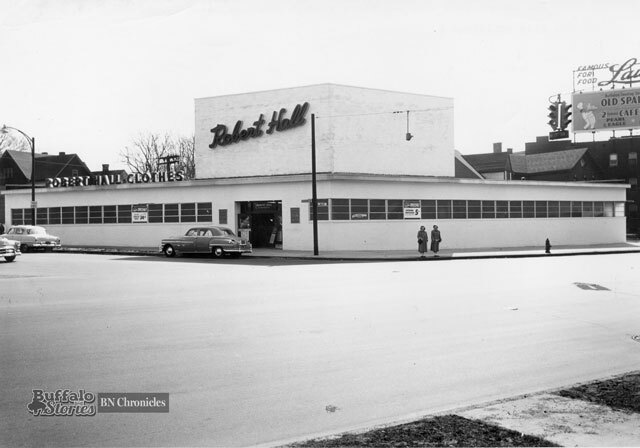 While over the last two decades its become the re-invigorated Hertel and Delaware Avenues that are the local shopping and dining destinations for Parksiders, for the 200 years previous, it was Main Street that served most of the needs of the people of the area we now call Parkside. 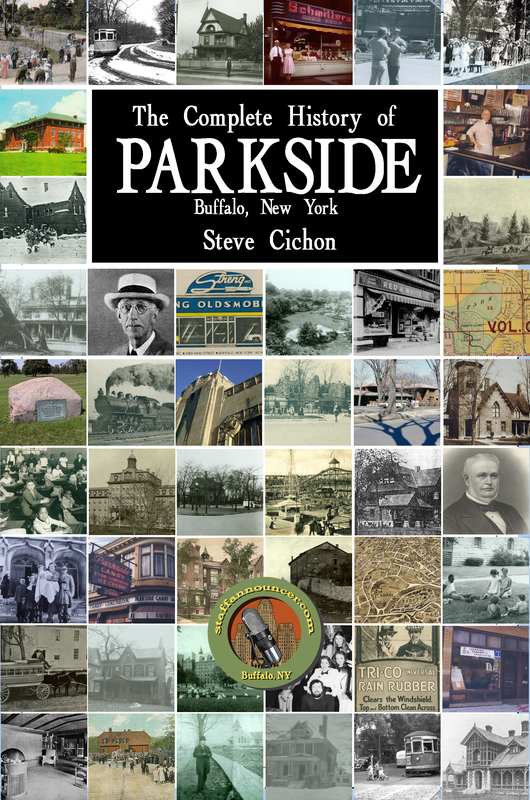 Over a three year period, third generation Parkside Resident and Definitive Parkside Historian Michael Riester wrote a series of articles, published in the Parkside News, examining the history Parkside’s portion of Main Street and role the stretch of road played in the life of the people of the area through the two centuries since the path was first carved from the wilderness. By the 1880s, once “The Park” was developed, and the modern streets of Parkside were laid out, the character of Main Street changed dramatically. Large homes, like the brick Victorian of the Garris Family at Main and Robie were being erected. The Garris family made their fortune in the Jammerthal quarries near Grider and Kensington.